SOUTH WILLIAMSPORT, Pa. (October 24, 2017) – After making a trip to Williamsport this summer to work the MLB Little League Classic, 36-year veteran Major League Baseball umpire Gerry Davis will share his knowledge and expertise with all of Little League’s volunteer umpires, joining Little League® Volunteer Umpire Advisory Committee. Mr. Davis was also selected to serve as the Crew Chief for the 2017 Major League Baseball World Series. Heading into his sixth World Series on Oct. 24, Mr. Davis has umpired more than 136 MLB postseason games, the highest of any umpire in MLB history, and four MLB All-Star Games throughout his illustrious career. 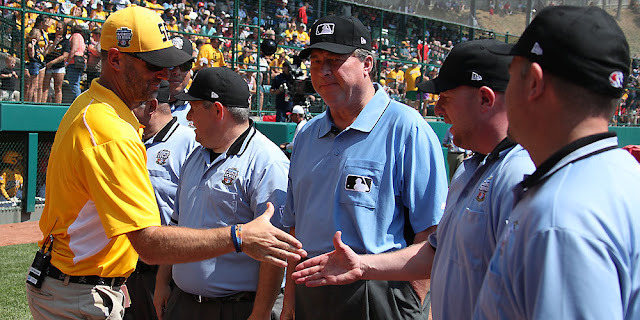 A Major League Crew Chief for 19 seasons, Mr. Davis also served as the Crew Chief and home plate umpire during the first-ever MLB Little League Classic between the Pittsburgh Pirates and St. Louis Cardinals at Historic Bowman Field on August 20, 2017. As part of the MLB visit to the Little League International Complex on August 20, Mr. Davis made history as he joined together with the six-man volunteer umpiring crew during Game 14 of the Little League Baseball® World Series to serve two innings as the second-base umpire for the game. One of the main goals of the Little League Volunteer Umpire Advisory Committee is to help Little League International establish consistent teaching methods and best practices that can be used at educational and training clinics organized by Little League International and Regional Staffs at locations around the world, based on first-hand knowledge and experience from the field.